To eliminate the possibility of guests arriving before the laundry is finished, it is a policy of Valet dAnniviers that clients must have at least 2 full sets of laundry. Our laundry services are available to Key Holding clients only and are not available to guests that have booked their stay in the property through a local letting agent. Cost of service - individually priced for each client, depending on a pre-agreed number of items. However, as a guide, on average our clients pay between CHF 17.50 and CHF 22.50 per person per visit for their laundry costs. 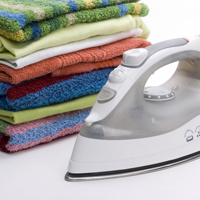 If ironing is required, there is an additional charge of CHF 7.50 per person.